Since I started making this so frequently, I decided to have the onion and bell pepper chopped up and ready to go for faster prepping time. I’ll do all the chopping at one time and store the ingredients in Tupperware. I also prefer to use minced garlic from a jar because it’s really handy, and honestly, I don’t really like chopping garlic. Alright, here we go…drizzle your olive oil in the pan and add your bowl of chopped veggies, minced garlic, and spinach, in that order. This will make it easier to toss the spinach around without your vegetables popping out of the pan. With a spoon, keep moving it all around until the spinach is cooked down. Once it’s done, put your sautéed vegetables back into the original bowl. Add a bit more olive oil to coat the pan, or you can even spray Pam for a thinner layer. Pour your eggs in and let them sit for about 20-30 seconds. Now spoon your sautéed vegetables into the center of the egg. You can also add a few crumbles of feta cheese. The tricky part now is to let the egg cook just enough to where you can move it around without it being too runny, but not so much that it breaks when your pulling the sides up to cover your vegetables. The more I made this the “prettier” my omelets got. 🙂 As you gently pull one side of the egg around the vegetables, I like to use the other side of the pan to help lift the other side over. Gently flip the omelet and let it cook a little bit longer. Once your omelet is fully cooked, transfer it over to a plate. 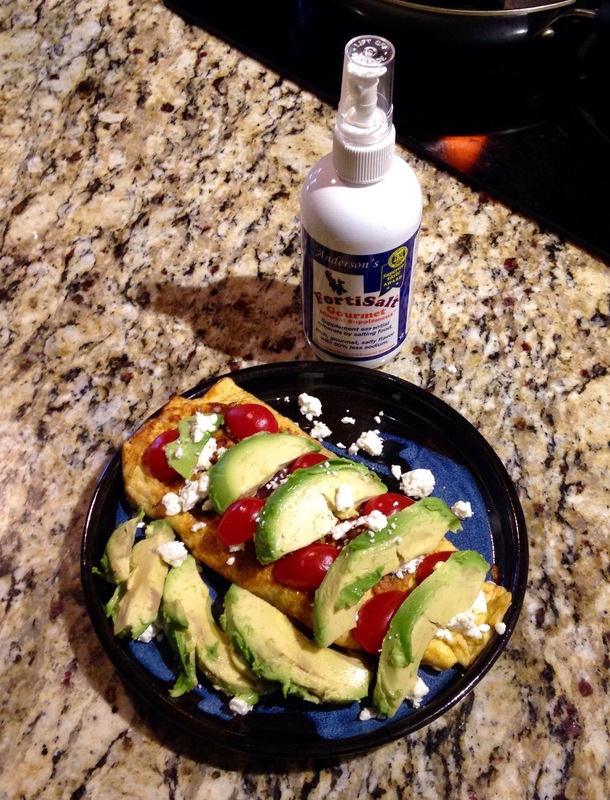 Top it with feta cheese, sliced cherry tomatoes, avocado for some bonus healthy fat, and a few sprays of FortiSalt. This is one of my most favorite ingredients to cook with because it introduces essential minerals and trace minerals into the diet that aid in muscle function. For those with high blood pressure, it’s good to know that FortiSalt will add the salty flavor in food with only 50% sodium. Hope you enjoy the explosion of flavors as much as I do!!! Until next time…bon appetit!